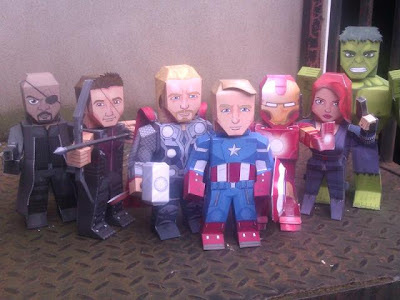 To celebrate the release of The Avengers, Xavior Gales-Sides began creating paper toy likenesses of each of the heroes in the movie. As this photo shows, his collection is finally complete! 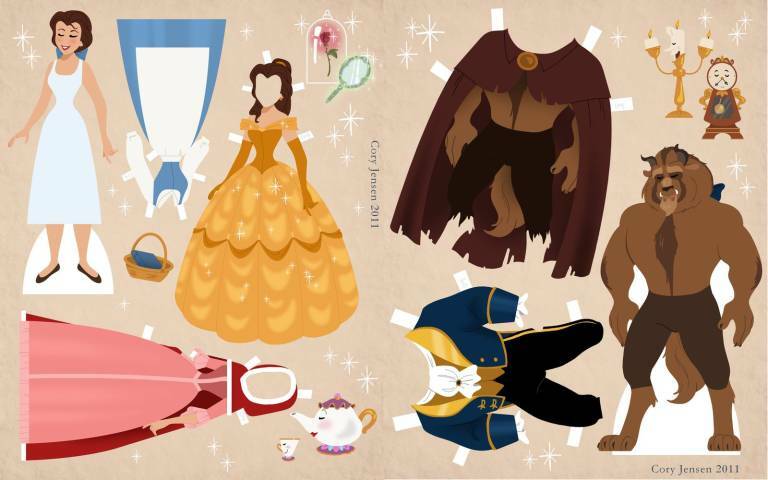 Links to the individual printable templates for the figures are located here. Previously featured paper toys by Xavier: the X-Men. 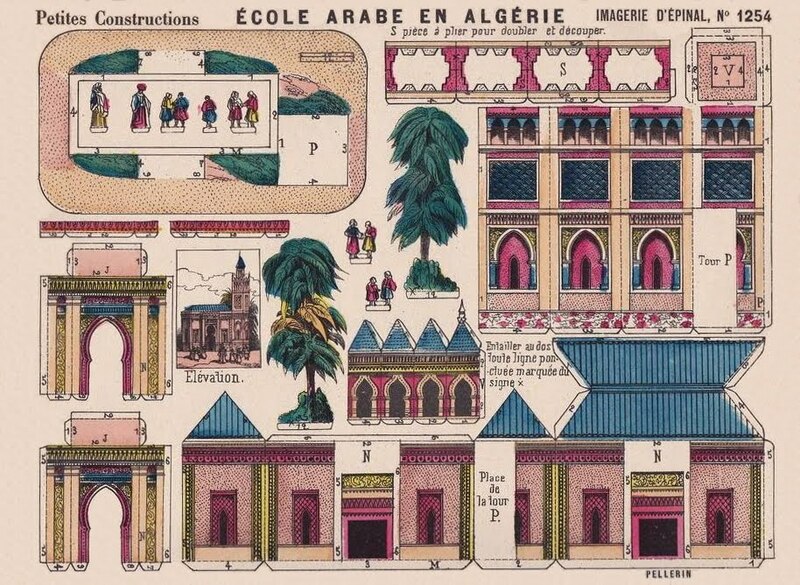 This French paper model from 1885 is titled "Ecole Arabe en Algerie" (Arabian School in Algeria). 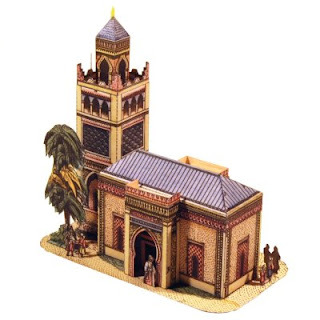 The architectural style of the building is what western architecture historians refer to as "Moorish". At times, US and European architects in the Victorian period copied details from Islamic architecture such as this in an attempt to achieve a "romantic" look for their designs. A scan of the template for the school may be viewed here. 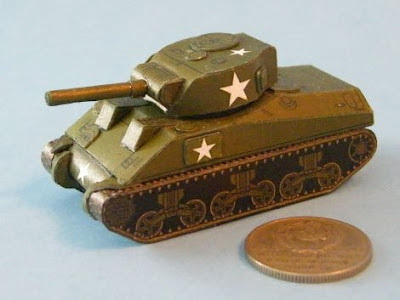 The M4 Sherman was the most common tank used by the US Army during World War II. This 1:100 scale papercraft of the M4 was created by Czech paper model designer Rawen. Rawen has designed dozens of free mini (1:100 scale) and micro (1:250 scale) models. The templates may be downloaded at his website, PR Models. In addition to military models, there are also several Star Trek models and a Stargate model available. My Little Pony papercraft is on the rise! This build photo by deviantARTist Puffinrailsociety features MLP paper models by two different designers. 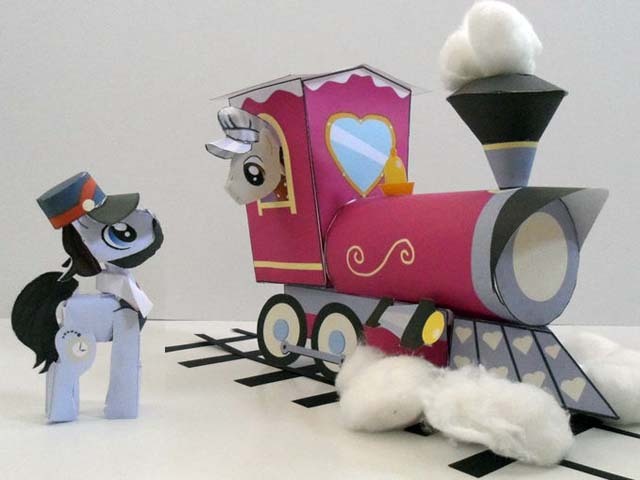 The papercraft Friendship Express train is by RocketmanTan. The engineer pony and the conductor pony are by Satalite5. The smoke on the train is created with cotton balls (in case you couldn't tell ^^). Cory Jensen created these Beauty and the Beast paper dolls back in January 2012 to celebrate Disney re-releasing the movie in 3D. I like the clean style of her graphic design work. The printable dolls may be downloaded here. I keep telling myself I ought to create more Star Wars papercraft, but until now I have completed only two (Clone Wars Holocron and Electrobinoculars). So I am happy to announce I have finally completed a third Star Wars model to add to the collection: a 1:1 scale training remote. A training remote was used by Luke Skywalker in the very first Star Wars movie when he was being trained by Obi-Wan Kenobi to use a lightsaber. 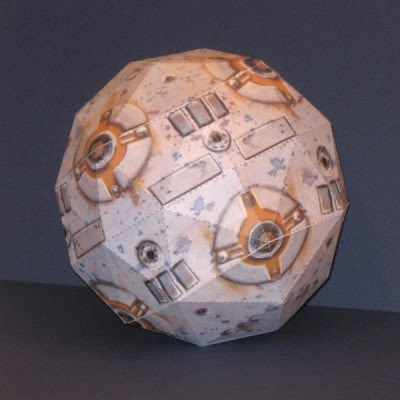 This particular remote model is based on a 3D model from the Star Wars: Jedi Academy video game. 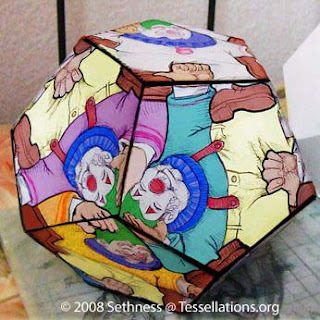 The papercraft template for the model may be downloaded here. The folks at the gopinball.com forum have created a nice collection of miniature papercraft pinball machines. 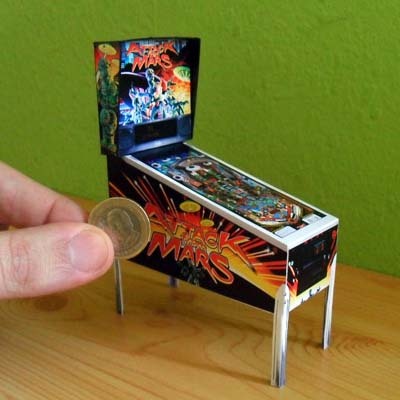 Each of the mini paper models is a replica of a real life pinball machine. Some of the pinball machines currently available are: Twilight Zone, Indiana Jones, T2 and Batman. Each of the templates is available for download here. As a bonus, if you look closely on page 4 of the forum thread you will find links to a template for a Tron Legacy pinball machine! 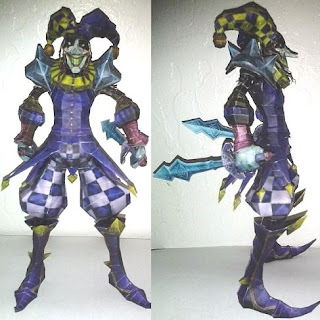 Shaco is an evil jester in the League of Legends video game who has some obvious similarities to the Joker from the Batman franchise. This papercraft Shaco is by Portaldragon who also brought us a Tibbers papercraft from LoL. The Pepakura PDO and PDF templates for Shaco are available here. 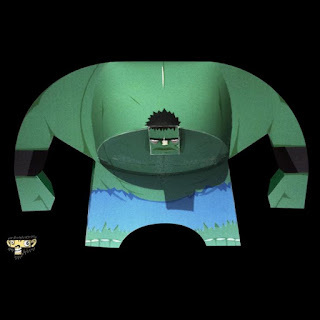 This has to be the most incredibly hulking Hulk papercraft around! ^^ This paper toy by Thiesko was not created with the current Avengers movie in mind. Thiesko designed the model in 2010 because, well, he just likes the Hulk. The two pages of the template may be downloaded here and here. Sengoku Basara began life as a Capcom video game. Later it was made into an anime television show. One of the main characters in the series is Keiji Maeda who has a little pet monkey named Yumekichi. 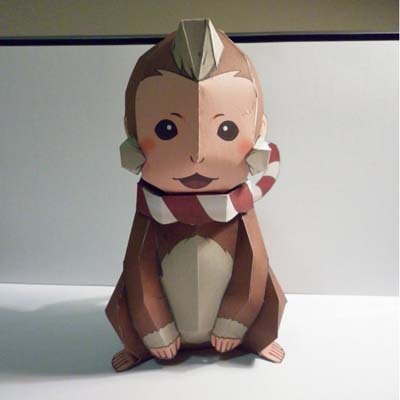 This is a papercraft of Yumekichi. The template and instructions for the model may be downloaded here. Build photo by hoshiterasu. 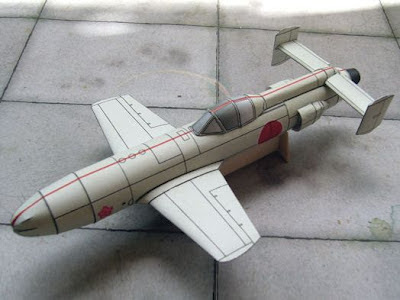 This Yokosuka MXY-7 Ohka Model 22 papercraft is a free sample from Thai Paperwork. The Ohka was a rocket powered Kamikaze attack plane built by the Japanese near the end of World War II. Although the Model 22 was never used in combat, an earlier version, Model 11, was deployed against the U.S. Fleet in 1945. The PDF template for the Ohka is available here. The finished model is at 1:48 scale. I am glad to see more people are creating League of Legends papercraft. The video game has some awesome 3D models. 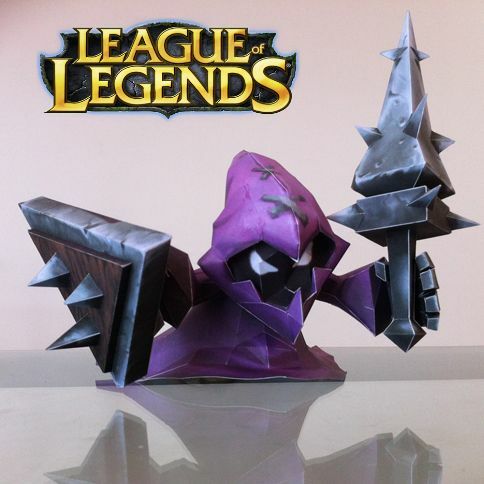 This LOL Purple Melee Minion papercraft by Malica looks like a Jawa with a bad attitude. ^^ Malica has an A4 size Pepakura PDO file posted here. But as the hosting site where the PDO is posted is known to give files a short shelf life, I have taken the liberty of saving a modified copy of the template in Letter size here (I have included both a PDF and a PDO file). From 1998 to 2012, thirteen different video games starring Spyro the Dragon were produced. Yet, there are only a handful of paper models of the character around. This papercraft by DeviantARTist Lord Bruco is my favorite of the lot. 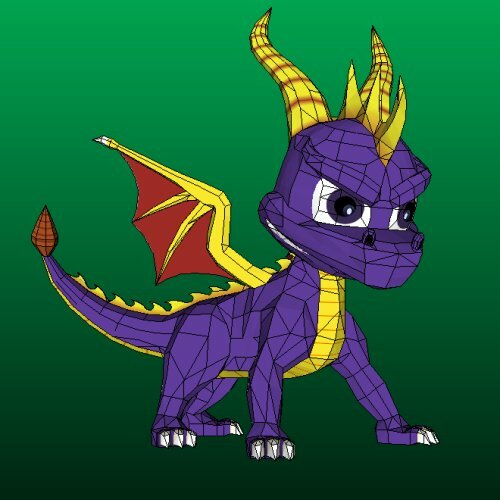 The template for this Spyro may be downloaded here (there are also some build photos to be seen there too). 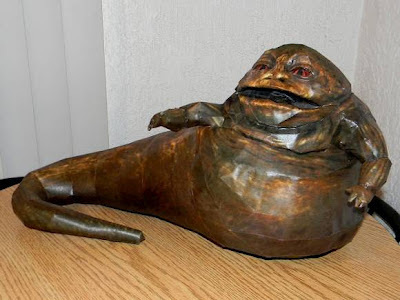 This king size 10.5" tall paper model of Jabba the Hutt is based on a 3D model from the Star Wars: Battlefront II video game. But wait, there's more! :) Also included in the RAR file with Jabba's template are a template for Jabba's throne (complete with pillows) and a template for a Han Solo in carbonite model. When is someone going to make a slave Leia papercraft? ;) All the Pepakura PDO templates may be downloaded here. Papercraft design by Noturno Sukhoi. Build photo by jp-papercraft. 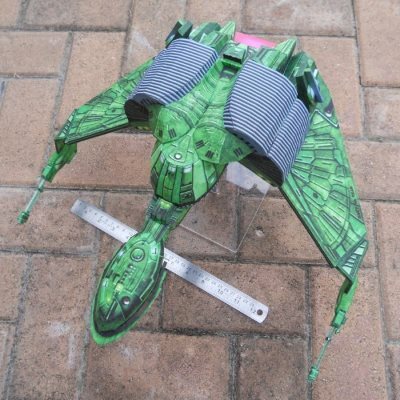 WuLongTi created these 2.5D fighter jets for use in a table top game. It just so happens that Wu is also a huge Transformers fan so he modeled the jets after the alt modes of the Decepticon Seekers. Included in the assortment are StarScream, ThunderCracker, SkyWarp, AcidStorm and SunStorm. The templates for the Seekers are available for download here. Build photo is by Aim11.